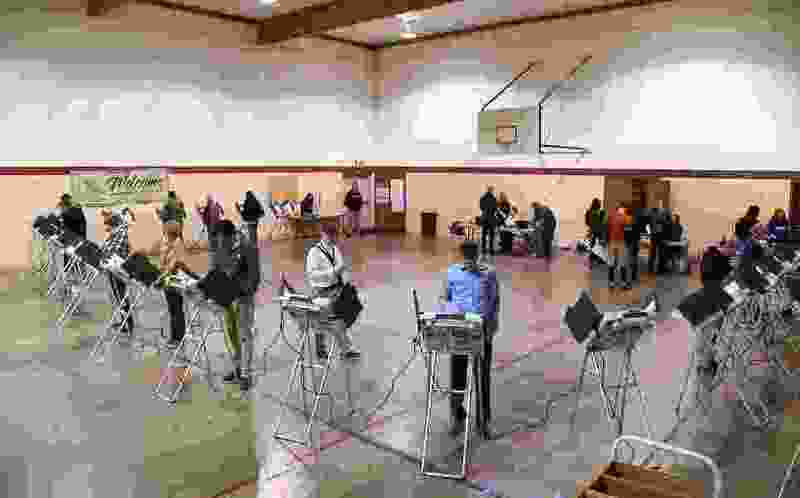 (Francisco Kjolseth | Tribune file photo) People cast their votes in the early hours shortly after the polls opened for the midterm elections on Tuesday, Nov. 6, 2018 at First Congregational Church in Salt Lake City. The costs and revenue sources of future Utah propositions would be listed at the top of the ballot under a proposed law that earned unanimous committee approval on Tuesday. Members of the Senate Government Operations and Political Subdivisions committee voted 6-0 for SB151, which requires initiative sponsors to explain the fiscal effect of their proposals in their application, and to make that information readily available at public hearings before they qualify for the ballot. The committee hearing came on the heels of debate over SB96, which replaced a full Medicaid expansion initiative with a more restrictive health-care program. SB96 was signed into law Monday over the opposition of supporters of Proposition 3 — which earned 53 percent of a statewide vote in November — with lawmakers and the governor arguing that the ballot initiative failed to cover the expense of providing Medicaid to 150,000 low-income Utahns. Phill Wright, a member of the Utah Republican Party’s State Central Committee and executive director of the advocacy group Keep My Voice, said “deceptive” ballot initiatives mislead voters and force legislators to make adjustments to balance the state’s budget. But Prop 3 did have an impartial analysis done by legislative fiscal analysts as required, and that projection — through the first two fiscal years of the measure — showed that it was economically sound, with revenues from its tax increase more than covering the costs of the program. Sen. Todd Weiler, R-Woods Cross, was the only Senate Republican to oppose SB96. But he said that after the November election, he spoke with several voters who did not realize Proposition 3 included a roughly $90 million sales tax increase. Weiler said he likes the initiative process but welcomes Henderson’s proposed changes, which also allow for initiative sponsors to challenge the fiscal estimates for their proposals. SB151 will now move to the full Senate for consideration.